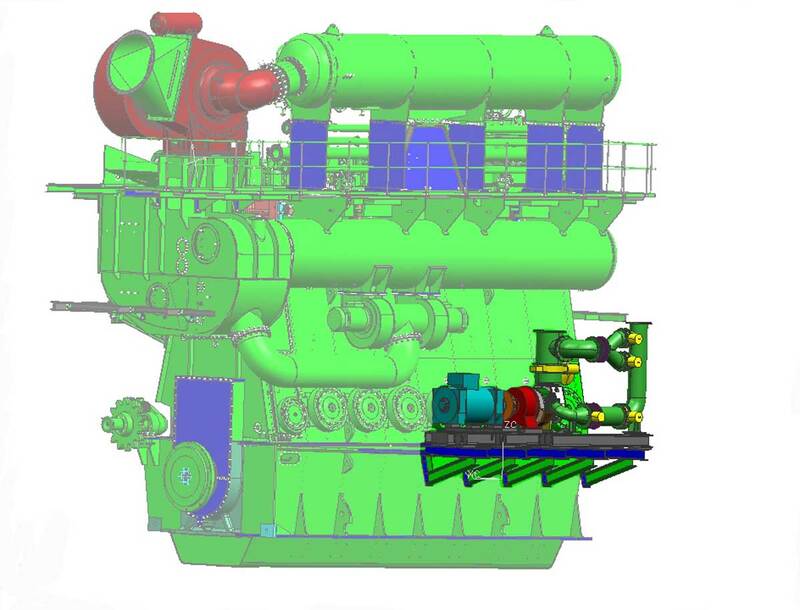 H. Cegielski – Poznan S.A. has ordered two MAN Diesel TCS-PTG18 Power Turbine systems from MAN Diesel’s Turbocharger Business Unit. The TCS-PTGs will boost the efficiency of two environmentally friendly, diesel power plants to be constructed by Land & Marine for renewable energy company Blue-NG in London. A H. Cegielski-built MAN B&W 7K60MC-S engine producing 13.9 MW lies at the heart of each plant. Blue-NG is committed to being best in class at building the most efficient power plants in the world, and is sparing no effort to optimally use the energy created by the two Combined Heat and intelligent Power (CHiP) sites. Accordingly, no less than 5 generators installed in 5 cycles will accumulate a total of 18.3 MW (electrical power) at each plant. MAN Diesel’s latest, market-leading, high-efficiency TCA turbochargers make it possible to divert more exhaust gas to power turbine-based, energy-recovery systems. In such applications, the power turbine is inserted into the exhaust-gas system parallel to the turbocharger. Here, it drives an electrical generator via a reduction gearbox and receives up to 13% of the exhaust-gas flow, diverted from the main-engine power. A TCS-PTG18 will be employed at each of the coming plants, based on the newly developed, high-efficiency turbine of a TCR18 turbocharger. A high-efficiency, high-speed gearbox will reduce turbine speed to generator speed, with the generator and gearbox connected to each other by a highly flexible coupling. The TCS-PTG will supply up to 570 kW to the grid and increase the power plant’s overall efficiency by some 3%. At lower engine loads, the TCS-PTG will be shut down. Control valves and fast-acting emergency valves for emergency shutdown are installed in the exhaust system to ensure reliable, safe operation. MAN Diesel holds more than 30 years’ expertise in the development, production and servicing of power-turbine applications, and can boast of some 50 reference plants, mostly installed aboard ships. The London order sets another milestone as it is thefirst order for the newly developed generation of power turbines based on the new TCR turbocharger series.